Since I’ve already created a Moocher Hall of Fame to acknowledge the strangest and most reprehensible examples of government dependency, it’s occurred to me that there also should be a Bureaucrat Hall of Fame to highlight the government employees that have figured out how to most successfully rip off taxpayers (and here are some good candidates for charter membership). But what if an entire bureaucracy was eligible? The paper pushers at the Veterans Administration sure have figured out how to milk the system. Check out these excerpts from Associated Press report. Nearly 80 percent of senior executives at the Department of Veterans Affairs got performance bonuses last year despite widespread treatment delays and preventable deaths at VA hospitals and clinics, a top official said Friday. …Workers at the Phoenix VA Health Care System — where officials have confirmed dozens of patients died while awaiting treatment — received about $3.9 million in bonuses last year, newly released records show. The merit-based bonuses were doled out to about 650 employees, including doctors, nurses, administrators, secretaries and cleaning staff. This is such an outrageous waste of money that even the politicians who created it feel it should be criticized. Rep. Jeff Miller, R-Fla., chairman of the House Veterans Affairs Committee, said the VA’s bonus system “is failing veterans.” Instead of being given for outstanding work, the cash awards are “seen as an entitlement and have become irrelevant to quality work product,” Miller said. Rep. Phil Roe, R-Tenn., said awarding bonuses to 80 percent of executives means that the VA was setting the bar for performance so low that “anybody could step over it. If your metrics are low enough that almost everybody exceeds them, then your metrics are not very high.” Rep. Ann McLane Kuster, D-N.H., said the VA suffered from “grade inflation, or what (humorist) Garrison Keillor would refer to as ‘all of the children are above average. '” Kuster and other lawmakers said they found it hard to believe that 80 percent of senior employees could be viewed as exceeding expectations, given the growing uproar over patients dying while awaiting VA treatment and mounting evidence that workers falsified or omitted appointment schedules to mask frequent, long delays. …Miller, the panel’s chairman, noted that in the past four years, none of the VA’s 470 senior executives have received ratings of minimally satisfactory or unsatisfactory, the two lowest ratings on the VA’s five-tier evaluation system. Or let me rephrase that. Government works very well…but only if you’re a politician, lobbyist, contractor, bureaucrat, or some other insider who has figured out that “the public sector” is a great way to obtain unearned wealth. If you’re a taxpayer, by contrast, you get the short end of the stick (I was thinking of another analogy, but decided to keep things clean). And if you’re someone – like a veteran – who is relying on government, then you’re in a very unfortunate position (sort of like the person in the other analogy that crossed my mind). The main thing to understand is bureaucrats respond to incentives. And when you have government programs with no bottom-line reason to deliver efficiency and good service, we shouldn’t be surprised that we get bloated payrolls and absurd compensation packages. This video explains that it’s a government-wide phenomenon. 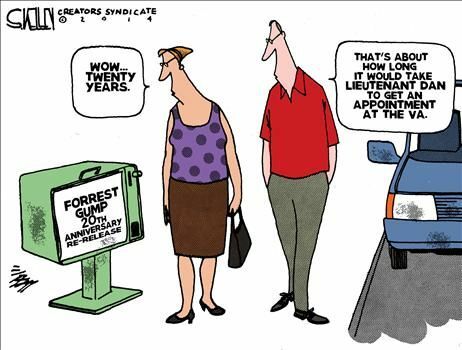 And to close out today’s column, here’s a Steve Kelley cartoon about Forrest Gump and the VA.
P.S. Don’t let politicians and interest groups get away with claiming that “inadequate funding” caused the VA scandal. P.P.S. And grit your teeth because the government-run veterans health system is a good predictor of what we’ll all experience if the government-run Obamacare system is fully implemented. P.P.P.S. Don’t forget that bonuses for poor performance are standard operating procedure in Washington. The bureaucrats at the IRS have been rewarded with extra cash notwithstanding all the scandals. Undeserved bonuses only scratch the surface. There are countless cases of travel voucher scams, theft of drugs, food, hospital supplies, contracting scams. Defund the VA, it’s the only solution. Read Ludwig von Mises’ 100-page book “Bureaucracy”. It explains everything.